The chemical element fluorine forms fluorides when it is combined with other chemical elements. 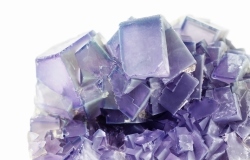 Fluorine is found mainly in a mineral called fluorspar which is also sometimes known as fluorite. It is a naturally occurring mineral which may contain up to 45% calcium fluoride (CaF2). In its natural shape it is formed with other minerals such as barytes, galena, pyrites and other sulphides. In its pure form it is colourless and transparent or translucent, with a glossy lustre. Impurities in the mineral can cause it a wide variety of colours, and some types may exhibit fluorescence. It is in fact one of the most colourful minerals in the world, appearing in a variety of shades from yellow and green through rose, red, pink and reddish orange to blue and black. The main deposits of fluorspar are now to be found in China, Mexico, Mongolia, South Africa and Namibia. Europe still has a small number of viable fluorspar mines, although the total has declined gradually over the years. It is a truly international business with world-wide consumption estimated at around 4.5 million tonnes per year.